A superb way to relax and enjoy the warm summer days in your favorite outdoor space, our Berlin Gardens Poly Comfo-Back Chaise Lounge is the perfect addition to your outdoor decor. Featuring a molded back, arched seat and multi-adjustable reclining positions for paramount comfort, our chaise lounge chairs are sure to be a favorite for you and your guests! Add our optional Sunbrella cushions and throw pillows to enhance your chairs comfort and amplify the beauty of your outdoor decor! Your Berlin Gardens Poly Chaise Lounge will pair perfectly with our Round Poly End Table to include a convenient place to rest favorite beverage! 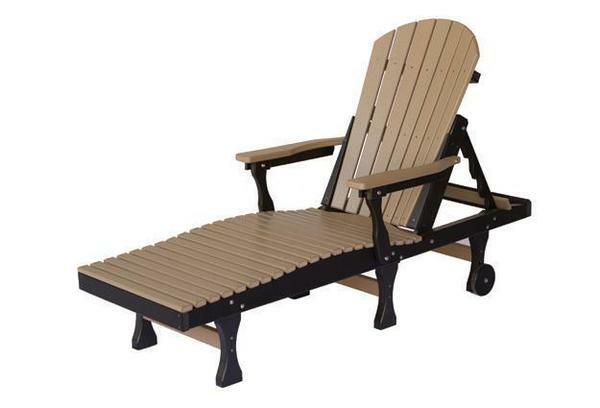 Handcrafted from eco-friendly poly lumber and backed by a twenty year warranty for residential use, your investment in maintenance free poly outdoor furniture is sure to last decades! Our Poly Comfo-Back Chaise Lounge Chairs are also perfect for commercial use. Next to your pool or on a relaxing patio, our chaise lounge chairs are sure to make your guests and patrons feel right at home. Available in an array of color options, choose the perfect chaise lounge chairs to incorporate into your outdoor design. This item is shipped unassembled, with minor assembly required. These beautiful chaise lounge chairs are suitable for both residential and commercial use. Height to Arms: 24 1/2"